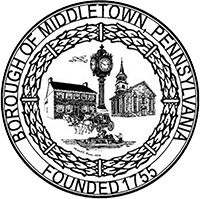 Through this Request for Proposal (RFP), the Borough of Middletown seeks to engage a respondent as Solicitor for the Borough of Middletown upon appointment. An original, clearly marked as the ORIGINAL and eight (8) full, complete and exact copies of each proposal shall be submitted in a sealed envelope and must be marked as “Borough Solicitor Request for Proposals” and addressed to: Ken Klinepeter, Borough Manager, 60 W Emaus St, Middletown, PA 17057. The proposal must be received no later than Friday, April 13, 2018 at 4:30 p.m. Faxed or emailed proposals will NOT be accepted. Any inquiry concerning this RFP should be directed in writing to: Ken Klinepeter, Borough Manager, 60 W Emaus Street, Middletown, PA 17057. The Borough of Middletown requires the services of a firm or individual that is able to provide legal advice on a variety of matters. The municipal solicitor should be knowledgeable in matters of real estate, labor issues, right to know, Sunshine laws, public bidding and contract, litigation and other areas of law that municipal solicitors typically address. This is outlined in the selection process section of this document. Contract shall be “at will” and may be terminated at any time, for any reason, upon a vote of the majority of the Council members. The Borough Manager and/or Borough Council reserve the right to interview any or all of the respondents submitting a proposal. Although interviews may take place, the proposal should be comprehensive and complete on its face. The Borough of Middletown reserves the right to request clarifying information subsequent to submission of the proposal. All proposals will be reviewed by the Borough Manager and/or Borough Council to determine responsiveness. Non-responsive proposals will be rejected without evaluation. For respondents that satisfy the Minimum Qualifications and the Mandatory Contents of Proposal the Borough’s evaluation will include but will not be limited to the following evaluation criteria, separate or combined in some manner, and not necessarily listed in order of significance: a) The respondents general approach to providing the services required under this RFP; b) The respondent’s municipal experience and to the engagement addressed by this RFP; c) The qualifications and experience of the respondent’s management, supervisory or other key personnel assigned to the engagement, with emphasis on municipal experience and to the services required by this RFP; d) The overall ability of the respondent to mobilize, undertake and successfully complete the scope of work in a timely fashion. This criterion will include, but not be limited to, the following factors: the number and qualifications of management, supervisory and other staff proposed by the respondent to perform the services required by this RFP; the availability and commitment to the engagement of the respondent’s management, supervisory and other staff proposed; e) Costs and fee schedules; and f) Other criteria as deemed appropriate by Middletown Borough Council. Any official questions and/or clarifications shall be directed, in writing, to the person noted below: Ken Klinepeter, Borough Manager, Middletown Borough, 60 W Emaus St, Middletown, PA 17057. Phone: (717) 902-0706. Questions may be answered in writing and distributed to all firms.